Contact James B. Huntington at 845-456-0115, jhuntington@royalflushpress.com, or through the Contact page on this site. True for centuries: (number of jobs) » (number of people needed for them). NO MORE! Three major questions: What is the problem? How do we know it is permanent? How can we solve it? How many more jobs could America absorb? 13.3 million for 90% of those officially unemployed, 1.1 million for 90% of those officially discouraged, 4.8 million for 80% of those who did not look in the past year, 3.9 million for 5% of those who “do not want a job,” 1.0 million for 20% of expatriates, 1.2 million for various shares of people with different statuses, 30 million for 100 million potential immigrants. Would you believe over 55,000,000? Why? Automation is getting more and more extreme - any job that uses linear logic is in danger. - Globalization has reached the point where Americans are more and more expensive. The number of workers worldwide who could replace Americans quadrupled from 1980 to 2007. - Health insurance is ever more expensive, efficiencies discovered during bad times carry on to good times, “structural” unemployment is nothing unusual, and no, all those baby boomers will NOT be retiring. Major social effects: Full adulthood’s starting later and later, people over 50 are becoming involuntarily retired, a new American underclass is emerging, a reverse brain drain, havoc between men and women, joblessness-related health problems. Non-solutions: Education and training as public policy, tariffs and other protectionism, crying about China. Partial solutions: cutting mid-range immigration, starting small businesses, economic stimulus money (last resort). Valuable possibilities for the short-run (next 15 years): A WPA-style infrastructure jobs project, separating health care from jobs, longer unemployment benefits, removing unneeded and destructive anti-job government regulations. The only long-term (15+ years out) solution: guaranteed income. The case for it: markets can only work if people have money to spend; people with lower income spend proportionately more; although manufacturing jobs replaced farming jobs and service jobs replaced manufacturing jobs, no paid work that we know of will replace service jobs. Now, we need to change our opinions in line with changing times, accept more modest but more reliably adequate lifestyles, redefine prosperity to include free and low-priced things, have a reasonably objective national dialogue on guaranteed income. If we continue thinking that any decent person has the opportunity to work, what could happen? A new feudalism; vast numbers of Americans without health, hope, or possessions; those with jobs or secure retirements spending their resources on self-defense; companies of all sizes crashing from lack of customers; possibly even civil disorder. 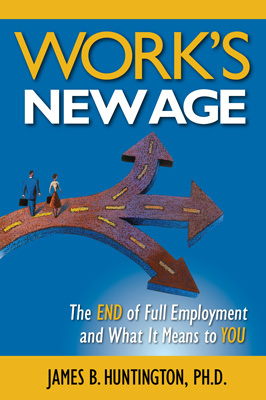 You can get WORK’S NEW AGE on Amazon (including Kindle), on barnesandnoble.com (including Nook), on www.worksnewage.com, or at any bookstore – if it’s not on the shelves, they’ll special-order it for you!